The new computer-designed ChordBender whammy has a great and unusual musical ability traditional whammies just cannot match and a much easier touch. Most whammies are stiff so they can be re-tuned without even more hassle. If you are considering one of the popular newer whammies Google its name (with tuning problems) to see why we worked hard on that problem. VIBRATO is just WAY better with a ChordBender, especially on chords (see the videos to hear the big difference). Guitar Player Magazine enthuses: "It could be a serious game-changer", "Pretty mind-blowing", & "Chords melt into each other." See the Shopping Guide (lower left here) and more! Unlike many other whammies, your ChordBender will STAY IN TUNE! What do people say about ChordBender? "If you want to take the whammy to a different level and use it as a musical instrument, then this has it's rightful place among the arsenal of tools that the modern guitarist has today." "I went to the site and listened to some of the compositions. The effects are quite dramatic." "I like the sound of that tremolo unit." "I love your chordbender it is great! I put a link to your site on my links page! Everybody I have showed loves your whammy!!!" 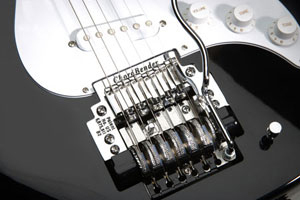 "The ChordBender really IS a revolutionary piece of engineering." "I still have no desire to get any other electric guitar. Except maybe a second guitar with a ChordBender on it. I also get better sustain out of bent vibrato with chordbender. I think the act of scraping the string back and forth across the fret is detrimental." "I went to guitar center to try some amps out. The guys there were astounded by the ChordBender. Cool reactions."